I Sweated to the Oldies today. Are you impressed? If you are not impressed, then you don’t know how much I wanted to skip it this morning. It was twenty-seven degrees outside and I actually had to go outside while the temperature was still twenty-seven degrees. That was because my husband drives a Honda Odyssey that was involved in the recent airbag recall. He made the appointment to get it fixed before anyone knew that arctic cold would be invading Florida today. Since his vehicle was in the shop, I needed to drive him to work. It was either that or let him take my car to work and I did not want to be without a car all day, so I put on a whole lot of layers and I took my husband to work. Well, technically, he drove, but I did drive myself home after he hopped out of my car and went in to his workplace. Okay, he didn’t hop. He doesn’t like his job that much; let’s be honest. After he trudged into the office, I drove myself home. The whole way there, I was arguing with the part of me that hates to exercise, who thought going out into the cold at the time we normally start the workout should be a good excuse to skip it. I wanted to skip it. I woke up depressed for no apparent reason and all I wanted to do when I got home was wrap myself in a blanket and drink warm beverages. Literally. I did that, in my living room, because I was so happy that the lethargy did not win. It was strong but I was stronger. I made a good choice on a bad day, and that turned it into a good day. I celebrated by baking a pie. 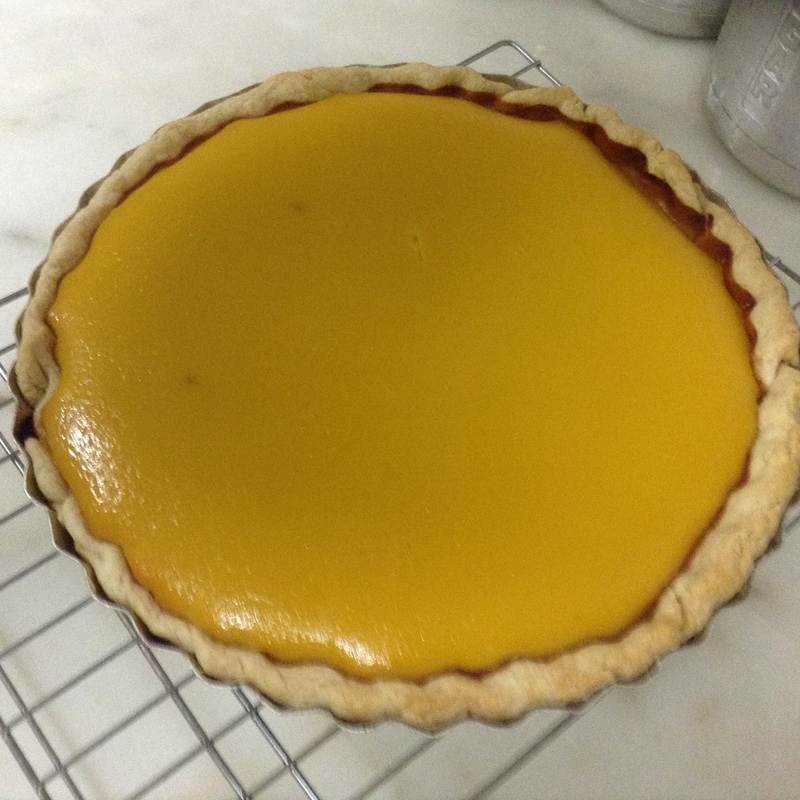 It’s an acorn squash pie. The recipe came from Martha Stewart’s Pies and Tarts, a book I fell in love with long before Martha Stewart became famous, built a media empire and served time for insider trading. She was just a caterer who wrote a book about entertaining and then wrote a book about pies. THE book about pies, the most beautiful book about pies ever written. This book is full of wonderful pie recipes, but the acorn squash pie is my favorite. Yes, I had this pie in mind when I picked out the Sweet Dumpling squash and the Golden Acorn squash that appeared in my recent paintings. I’ll admit to a little pang when I plunged a knife into them, gutted them and cut them into chunks for steaming. I got over it. The pie is delicious. This entry was posted in Uncategorized and tagged baking, depression, exercise, Martha Stewart on November 19, 2014 by releaf1954. Wednesday has become blog day for me, and it dawned a little ugly this morning. I woke up with a bit of a headache and the voice of my ever-present depression whispering in my ear. It doesn’t try to talk me out of doing Morning Pages because it knows that’s a lost cause, but it will start trying to talk me out of my Sweatin’ to the Oldies while I’m still writing Morning Pages. It will tell me the headache is a good reason to skip the exercises. I don’t feel well, so I should just rest and not work out. That sounds reasonable, but I know it’s just a big, fat lie my depression uses to get its its foot in the door and make itself at home for a while. Sometimes it works, but today I had enough fight in me to put on my workout clothes as soon as I finished my Morning Pages, and hit “Play” on that DVD. I use the DVD because that’s often all the fight I can muster. Once I hit “Play,” that’s all it takes. If I start the workout, I will finish it. Starting may be a huge battle but once I start, the battle is won. I started today, and I worked out for an hour. Thank you, Richard Simmons. The Sweatin’ helped. It always does. It’s the one thing that helps the most since I went off antidepressants a few years ago. Today’s foul mood was persistent, though. Fortunately, I was still able to remember that there are other things I can do that will make a difference. My depression tries to make me feel lame, inadequate and worthless, so it helps if I can do something to prove it wrong. On my worst days, the best I can do is save a video game world, but today was not one of my worst days. 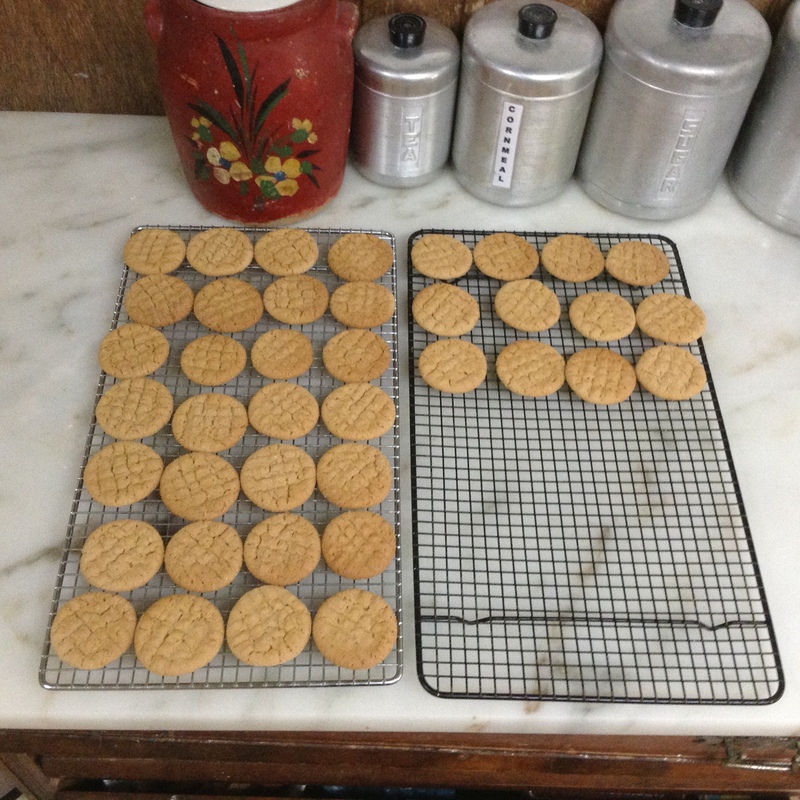 Today, I went into my kitchen and baked cookies. I probably don’t have to tell you what kind of cookies these are. I’m sure you recognize the crisscross. If I ever bit into a cookie that looked like this and there was no peanut butter in it, I would be appalled. I used the classic recipe from the Better Homes and Gardens Cookbook. I felt a lot better when the cookie jar was full, but I was still restless. I needed to bring out the big guns. I mean the teeny tiny yeastie beasties. I was fighting a very tenacious bad mood and I needed to do something impressive. I impress the heck out of myself when I make yeast rolls. 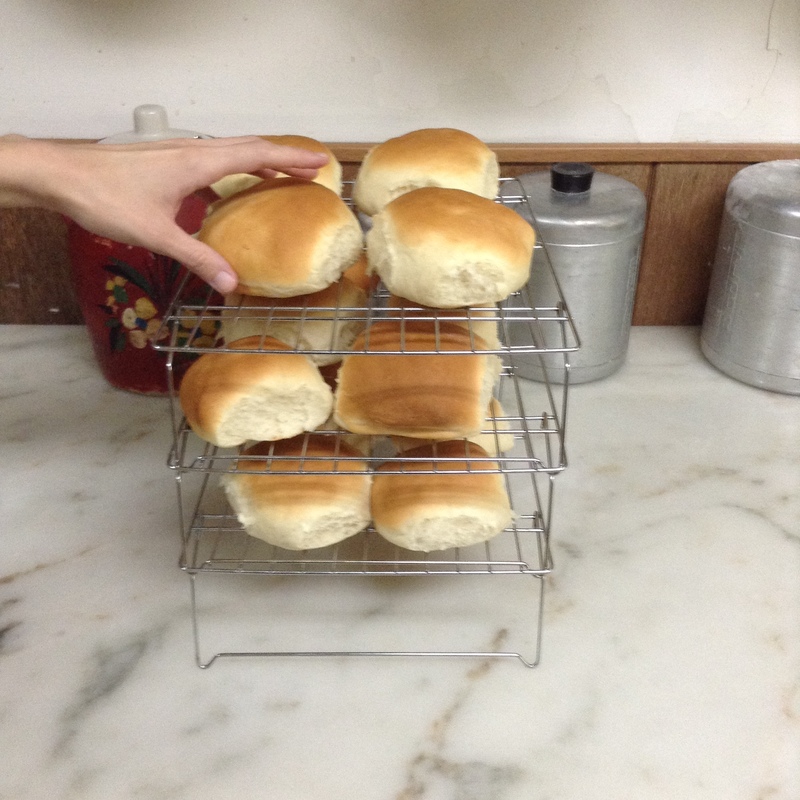 These are Soft Sandwich Buns and the recipe is from The Farm Cookbook. I love that little book. It reminds me of my young married days, when I first became a vegetarian and didn’t know tofu from tempeh. That book taught me how to make both, but it also taught me to make these wonderful fluffy white buns. My daughter was tired of waiting for them to cool. I am not lame. I am not inadequate. I am not worthless. I made yeast rolls. I rock. This entry was posted in Uncategorized and tagged cookies, depression, exercise, fighting depression, Richard Simmons, yeast rolls on August 20, 2014 by releaf1954. There has been a lot of upheaval in my life these past few weeks. We normally spend the month of June just recovering from our biggest tie-dye event of the year, the Florida Folk Festival. This year, we were coping with illness before we even left the festival. My grandson’s cold was the little snowball that rolled through the family and down the big hill of my husbands weakened immune system, becoming a huge problem when it turned to pneumonia. That was on top of the heart attack we didn’t know about until we went to the Emergency Room because of the cough that wouldn’t go away. I caught the cold, too, of course. We were both still coughing a bit when we went on our vacation to North Carolina. That was a wonderful experience, but it was still a big departure from our normal routine, which I was starting to crave by the time we returned to Jacksonville. I wanted a quiet, ordinary day with room for some self-care. Today was that day. I finally got back to Sweatin’ to the Oldies. Go ahead and laugh, but Richard Simmons keeps me moving for an hour and nothing else has ever done that, so I’m grateful. I had no idea how much aerobic exercise could help my mood until I went off anti-depressants a few years ago. The medication got me through menopause, but I wanted to see if I could manage without it once I made the passage. It turned out exercise was the key. It makes almost as much difference as medication and it’s a whole lot cheaper. I had let it slide since the festival because things were so crazy, but I knew I couldn’t do that much longer without falling into the depression pit. Today, I worked out. After a shower, I sat down to meditate. Every time I do that, I remember why I want to do it more often. The whole day goes more smoothly if I practice self-care before I do anything else. Once I got my day off to such a good start, I was able to enjoy running errands and taking my daughter and grandsons shoe-shopping. I also played some games on my i-Pad. These are free games designed to tempt you into spending real money in order to speed up your progress. If you’re determined not to spend real money, you have to take long breaks to let energy or coins build up. They’re perfect for someone like me, who will play obsessively as long as possible but will definitely NOT spend real money to do it. I also painted. I planned to make a squash casserole for supper, so I bought some yellow squash when I went to the grocery store. 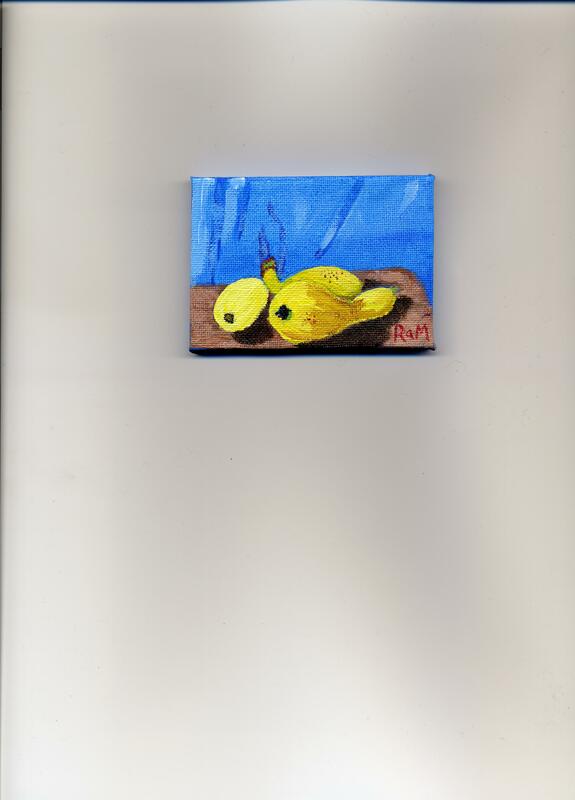 I decided this would be a good day to add to my series of tiny paintings of fruits and vegetables. I took a look at the others and realized I didn’t have one with a blue background, so I set up some squash on a cutting board in front of a blue cloth. I worked out, I meditated and I painted. It was a good day. This entry was posted in Uncategorized and tagged exercise, Florida Folk Festival, meditation, painting, Richard Simmons, self-care on June 25, 2014 by releaf1954.